I haven’t been watching Doctor Who for that long; I only jumped in at the end of season 2, but since then it only seems to be getting better. Last week I decided to watch all the episodes I hadn’t seen and watched the first two seasons, so now I’m kind of on a Doctor Who high. I loved last Saturday’s Doctor Who episode, the penultimate episosde of this season (The Stolen Earth) and just had to take some time to theorize about the finale. I don’t want to spoil anything, so: beware, spoilers after the pic! If you’re reading this I assume you’ve seen the episode I’m talking about and the major cliffhanger at the end: the Doctor starts regenerating! Seriously, was anyone expecting that? The moment he got shot, I of course had the feeling that would happen, but before that? No way. And now what? How will this be resolved? Reports are that David Tennant has signed on for the three specials of next year and has even started filming some of it. But can we actually trust these sources? 1. The Doctor regenerates into a new actor and stays that way. If this is the case, I have to applaud the makers for keeping this secret. In this darn age it seems an impossible mission and if they actually managed not to reveal this major spoiler… freaking amazing. I don’t think I’d be that happy though with this option, cause that means no more David Tennant! I’m sure whoever they’ll get to replace Tennant will be great and we’ll warm up to him, but still let us keep Tennant a few more seasons. 2. 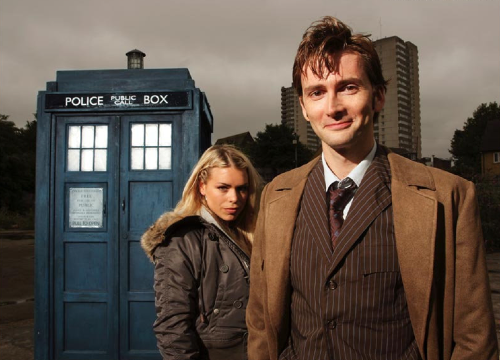 The Doctor regenerates into a new actor, but turns back into Tennant. In this scenario there are two things that could happen. First one is that this new form the Doctor turns into is a one time appearance. He changes back into Tennant and this form is never seen again (with some mumbo-jumbo that time has changed so the next time he regenerates it won’t be into that form). Second thing that could happen is that this is a preview of the next Doctor. Whenever Tennant leaves the show, this is the actor who will take over. 3. The Doctor “degenerates” into a previous incarnation and stays that way. Ehm, well, it is a possibility, right? But, yeah, highly unlikely. 4. The Doctor “degenerates” into a previous incarnation, but turns back into Tennant. I could see this happening. I wouldn’t put it pass Davies to bring Christopher Ecclestone or an earlier Doctor back for a moment, only to “fix” it and continue with Tennant. It also wouldn’t be too difficult to have kept secret; a couple of scenes with the previous Doctor on a closed set, pretty easy to keep quiet. 5. The Doctor tries to regenerate, but is stuck in his current form. I think this would be the most boring option; something goes wrong, so the regeneration can’t be completed and they have to find some other way to heal the Doctor or something like that. After all the big fuss, it would kind of feel like the easy way out and I would really be disappointed if they do this. It has to be something “grander” than this, don’t you think? The first situation would be the most shocking and sure to go down in TV history, but I don’t think it will happen. With what we’ve heard about Tennant, I truly think he’ll be back for future episodes. I’m hoping it won’t be the 5th option, but from the others I’m not sure which I’d rather prefer. So do you think I’ve covered every possibility? Or will Davies do something even more ridiculous? Any other possible scenarios you can come up with?